The fever is a prominent symptom. High fever. Chills and heat chase one another. Watery discharge from the nose. Itching and redness of the skin. Complete thirstlessness or very little thirst. Face dark red, swollen, besotted look. Child is dizzy, drowsy, doesn’t want to be disturbed, desires to remain quiet. It is followed by Pulsatilla. Puls. may follow when Aconite has reduced the fever but leaves other symptoms untouched. It is indicated when the catarrhal symptoms are prominent. Eruptions slow in coming out or when fully out. Coryza with much sneezing and profuse lachrymation. The child sits up in bed to cough. Mild fever. It is not the remedy if the fever is high. If the fever is high do not give Puls. in the beginning. If the fever is high give Aconite, Bryonia or Gelsemium according to the symptoms. Puls. can be given as prophylactic remedy against measles epidemic. Puls. 30 once or twice a day for 8-10 days. Tearing pain in chest when coughing. It is also indicated when the eruption suddenly disappears and cerebral symptoms with drowsiness appear. The cough is dry and painful., there is soreness of the limbs and body, stitches in the chest etc. Any motion causes child to scream with pain. Mild delirium, “Wants to go home” when at home. The cough is very dry and hoarse. Intense throbbing headache which is relieved on appearance on the eruptions. It is indicated after Pulsatilla, which is suited for milder symptoms, while Kali Bi. for the more severe. Measles with purulent discharge from eyes and ears. Throat swollen and pains go from throat into the ears. The external auditory meatus greatly swollen. Discharge of offensive pus from ears. Violent stitching pains in the ears. Loud rattling cough with retching and expectoration of tough, stringy mucus. It comes in very well after Puls., when the patient develops more intense symptoms. 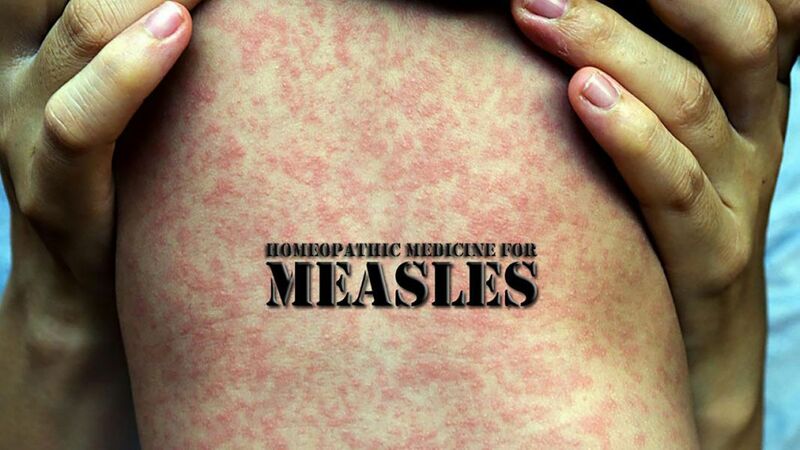 Measles associated with ear symptoms and swollen glands, especially call for Kali Bichromicum. It is useful in black or hemorrhagic measles or retrocession of the eruptions. There will be sinking of strength, diarrhea, delirium, restlessness and debility. The stools are particularly offensive and exhausting. It is prophylactic and curative and one of the best remedies to remove all sequel of the disease. Hoarseness and dry cough, which fatigues the chest. Constant drowsy sleep or drowsiness. It is useful when eruption does not come out properly or when it disappears suddenly. Tosses about, cries as if frightened.